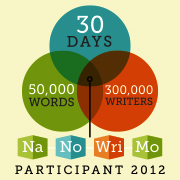 November has arrived, and it's time to embark on the annual NaNoWriMo writing challenge, to write a 50,000 words book in 30 days. This year I'm working on a non-fiction book, despite the word "novel" in the challenge's title (National Novel Writing Month). Since it's no longer "national", I'm stretching the definition of "novel" a bit and using the challenge to write non-fiction. It's still a very personal and creative work, just not a work of fiction. As with previous years, I prefer not to discuss the contents of my work while it's in process. But I can talk about the process of writing, and hope this will interest fellow writers and other language professionals. This is a project I've been thinking about doing for a long time. I created a bit of an outline before I started. I wrote a list of 30 subjects that can serve as chapters or sections within the book. I don't know if they will all be of equal length, or whether I will be able to work neatly on one section a day, but the idea of 30 subjects in 30 days seemed like a helpful plan, at least before the fact. I'll have to wait and see how it turns out in practice. With this book, it should be possible to rearrange the 30 sections in an order or structure that will start to emerge once they are written. I think I should do this after the whole thing is written and I can see it holistically. I know it may involve a lot of rewriting, but that might be easier when I can move around things I have already written. Editing this non-fiction book might be more similar to the sort of academic editing I do professionally, compared with editing novels, which I have never done. I have already written more than the recommended minimum today, and feel very positive about this project. I will have more to say about the differences between writing fiction and non-fiction later on. Good luck to all participants, and to writers everywhere!